While the chicken is braising in a slightly sweet and tangy glaze, the potatoes are in the oven getting deep golden brown and crispy. I wouldn’t want to be late for that meal, would you? It just screams Sunday supper. 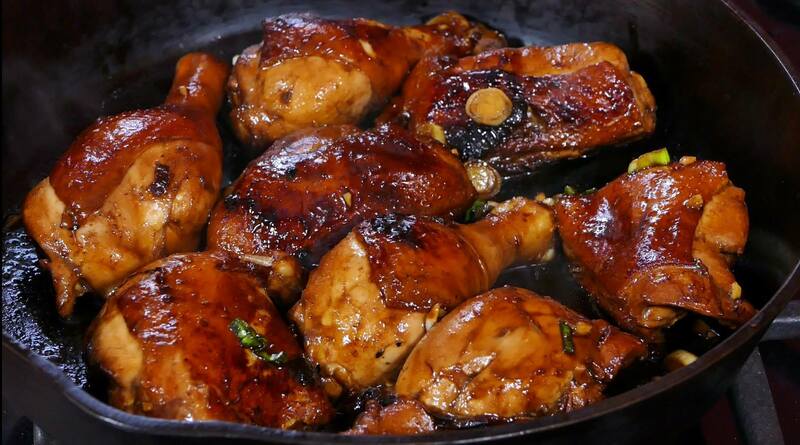 Sticky Chicken is one of those recipes often found in old Southern cookbooks. The chicken is marinated in a rich balsamic-soy sauce-honey blend, and then cooked until gooey and sticky on the outside and fork tender on the inside. The potatoes? Well, people try all sorts of methods to get oven baked potatoes to look and taste more like a home-baked potato chips. Your search is over. Roughing up the potatoes is a technique that coaxes them into crispiness. By the way, the chicken is just as tasty cold for the next day’s lunch!